We are the leading manufacturer of Crank Rods. With a firm commitment to quality, our organization is involved in offering a wide ambit of Take Up Lever Drive Crank Rod. - Our goods are of very good quality and durable, and are installed in Chinese embroidery machine, Tajima embroidery machine, SWF embroidery machine and barudan machine. We are engaged in manufacturing and exporting a wide range of crank rods. 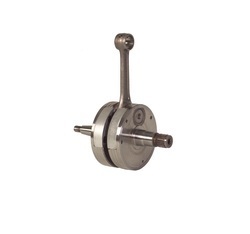 We are engaged in manufacturing a wide range of crank rods.